In 1992/1993, the Church of Lady - a National Historic Site - underwent major restoration. The work included full repointing of masonry joints and the repair or replacement of a considerable number of crtacked masonry units. Unfortunately, the full cause of the cracking and damage to the twin towers' masonry was not fully understood at that time and the problems resturned within a few years. 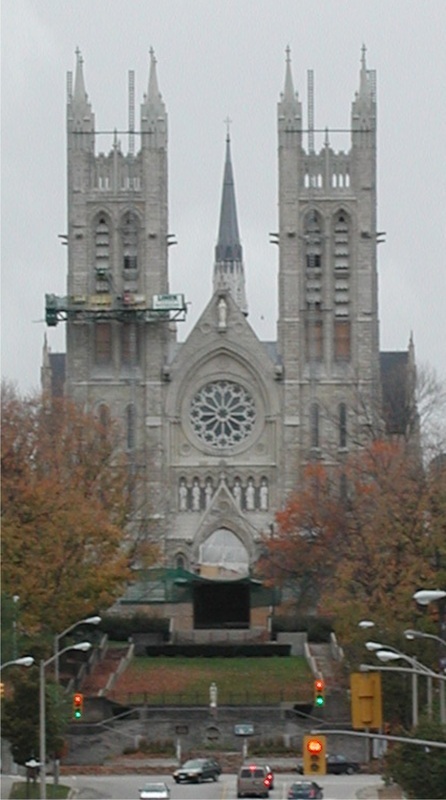 In 2007, the challenge was how to restore the towers to a durable condition, while preventing the cracks from re-opening once more. After a thorough investigation, which included the use of ground penetrating radar to confirm the presence of considerable voids hidden within the inner core rubble of the masonry, a strategy was devised that included stabilizing the towers using stainless steel helical masonry ties and filling the voids with a lightweight cellular foam cement grout using low pressure injection methods. A series of structural steel ring beams were also installed within the towers at various levels. The ring beams were designed with sliding joints so that a certain amount of controlled displacement could occur - thus preventing the tower walls from acting in a non-composite manner. Cracks were then repaired.